In attempting to minimize the risks attendant to human rights work in an authoritarian setting, Ethiopian NGOs have been hesitant to support young activists who face government persecution. The real test for human rights organizations, whether they work in democratic or non-democratic settings, is how they respond to the most difficult, and at times controversial cases of rights abuses. Fear of government reprisal should not prevent those who claim to work for a free and democratic Ethiopia from standing in solidarity with activists facing persecution. The Ethiopian government levied terrorism charges against seven bloggers from the Zone 9 collective (one in abstentia), and three independent journalists on July 17, 2014, almost three months after detaining them in April. With the 2015 national elections approaching, there are indications that the arrests were politically motivated. No credible evidence has been provided to substantiate the government’s allegations, that the bloggers were connected to terrorist organizations, and that they were planning to destabilize the country. In fact, there is every indication that the bloggers were using social media to peacefully voice their concerns about the lack of democracy in Ethiopia, promote civic dialogue among the youth, and organize virtual campaigns; including one calling on the Ethiopian government to respect the country’s liberal constitution. The arbitrary arrests and detention of the Zone 9 bloggers and journalists generated a substantial outcry. Regional and international organizations such as Amnesty International, Article 19, the Committee to Protect Journalists, East and Horn of Africa Human Rights Defenders Project, Freedom House, Human Rights Watch, the Media Legal Defense Initiative, and Reporters Without Borders, have denounced the arrests as one more example of the disregard for rule of law in Ethiopia, and called for the immediate release of the activists. During his visit to Addis Ababa in April 2014, a few days after the bloggers and journalists were arrested, US Secretary of State John Kerry privately raised concerns with Ethiopia’s Prime Minister and Foreign Minister. At a press conference, the Secretary emphasized that anti-terrorism proclamations should not be used to curb the free exchange of ideas. The US State Department has since reiterated these concerns. In the face of this vocal advocacy from regional and international human rights institutions, the lack of solidarity from Ethiopia-based organizations is both disconcerting and disheartening. The silence of Ethiopia’s diminished rights-based organizations can partly be attributed to the 2009 Charities and Societies Proclamation, which created a repressive environment for NGOs. One provision of this law prohibits organizations that receive more than 10 percent of their funds from foreign sources from engaging in activities intended to promote democracy, human rights, conflict resolution, and the protection of the rights of women, minorities, and ethnic groups. The Charities and Societies Agency, a newly established regulatory body, is authorized to monitor NGOs, interfere in their internal affairs, and dissolve organizations found to be in contravention of the law’s largely ambiguous directives. As a result, the nascent civil society sector in Ethiopia has been crippled. Many NGOs have had to change their mandates from rights and advocacy related activities, and direct their focus to less controversial areas such as development. 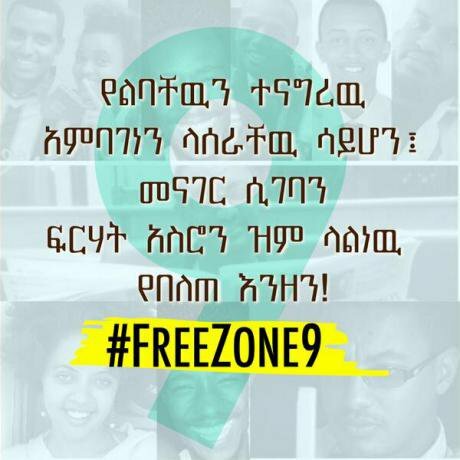 The absence of public advocacy for the Zone 9 bloggers and journalists by Ethiopia-based organizations is symptomatic of the proclamation’s impact on rights-based work. None of Ethiopia’s NGOs have dared to join the international outcry and call for the release of those arrested. Even after the youth were charged under the country’s draconian and overly broad anti-terrorism proclamation, which has consistently come under international scrutiny for being used to circumvent freedom of expression, we have yet to see a principled stand from Ethiopia-based organizations. While some might defend the disinclination of rights-based organizations to engage in public acts of solidarity, the dearth of private encouragement and support for the young activists is nonetheless disturbing. Even before the Zone 9 bloggers were arrested, some civil society leaders were uncomfortable, and at times unwilling, to attend private human rights events that were inclusive of the bloggers. Although such precaution may help to ensure the survival of some Ethiopian NGOs in the short-term, it will surely be a detriment to the human rights sector in the long run. In an authoritarian environment, trying to eliminate risk from the inherently risky field of human rights work is not realistic. So, what would solidarity look like? True solidarity would begin with publicly embracing the bloggers as activists with a legitimate place in discussions about human rights, and being prepared to support them without regard to the government’s accusations. Under the current circumstances, prison visits would go a long way toward fostering solidarity, as would attempts to investigate the incidents of abuse and torture that the detainees have reported. Ethiopian human rights organizations can play an important role in monitoring court proceedings and coordinating pro bono legal services for the young activists where necessary. NGOs could also demonstrate solidarity with their fellow activists by using available channels (be it with government officials, the diplomatic and donor community, or regional and international organizations) to appeal their convictions. Ethiopian NGOs can learn from the online and offline activism that has sprung up in support of the bloggers and journalists. Since the arrests, young Ethiopians have taken to twitter and other platforms under the #freezone9bloggers campaign. Within four weeks, the trial tracker blog went up online and now acts as a repository of information about the arrests, court appearances, and issues related to freedom of expression in Ethiopia. Numerous youth have appeared at each scheduled court hearing, and many have visited the bloggers and journalists in prison to show their support, despite the constant threat of harassment from security officials. Ethiopia-based human rights organizations would benefit from reaching out to concerned youth and other citizens as potential members and volunteers, to nurture their passions and encourage their activism. In fact, such an approach could infuse much needed dynamism and creativity into these beleaguered organizations. In light of current limits on financial support from foreign sources, engaging and recruiting politically conscious youth could become an important method of strengthening the human rights community, and promoting a more open and inclusive Ethiopia.